We all had a wonderful time and memories of a lifetime. Anytime you talk about a trip with friends, they ask a lot of the usual questions. What did you see, did it cost a lot, how was the weather, etc. However, one friend asked only two rather simple questions about the trip, what were the highest and lowest points? No one had ever asked me those questions before. Anyway, without hesitation, my answer for the highest point was the Eiffel Tower; we have made it to France. It is the iconic representation of Paris and France, at least from an Americans' point of view. Paris, no doubt, is one of the great cities of the world. So the question about the lowest point - I said leaving the Johanna. I especially had just a great time aboard your vessel. You were the best hosts anybody could ever imagine. You provided fabulous food, refreshments, conversation, transportation, everything. You really opened your hearts to us. Fun seeing France from a barge. Patsie's meals were absolutely wonderful. We want to take her home with us for her healthy ccoking! Comfortable, informal - everything we wanted and more. So glad we experienced this. Thank you for your hospitality. Thanks for a wonderful adventure! It far exceeded our expectations. You guys are super hostesses. Food was exceptional. Enjoyed our trip and would like to return! Il n'y a pas de hasard dans la vie! Patsie et Kris, des hôtes remarquables et d'une générosité incroyable. Ponctuons, désormais, l'avenir de moments festifs et pétillants! Free translation: There are no coincidences in life! What a beautiful meeting! Patsie and Kris, [are] outstanding hosts with incredible generosity. Let us agree now on a future of festive and sparkling moments! Champagne! Didier M., Château-Thierry, FR, Août 2017. This was our best family vacation ever! Thank you! also for your companionship + camaraderie. What a terrific trip, beautifully planned and conducted by warm, professional hosts. Outstanding in all aspects and thank you for the great cuisine. A wonderful voyage with gratious hosts, delicious meals and exceptional service troughout. It's not about the destination, it's all about the journey! Thanks for the delicious, beautiful, inspiring + peaceful adventure! What a superb trip. Thank you all for making this such a memorable - beautiful vacation! PS: Patsie's delicious cuisine, the fabulous Johanna, a very well done ship and all the friendly assistance will be permanent memories! Barge was wonderful!! The crew was spectacular, and we all said we would go with them on another (different area) cruise. The Johanna was very ship shape and comfortable. We found the A/C in the staterooms very nice. Patsie was a wonderful cook!! Best food on the trip! Breakfast, then cruise in the morning and tie up around lunch. Lunch on board then the van would meet us to take us sightseeing. Back to the boat for a little rest, cocktails and dinner. Very relaxing way to travel. Nice too, because, except for Epernay, the area is not overrun with tourists. Bedankt voor het receptje hoor! Zal dit zeker uit proberen! (ik kook graag) We hebben echt genoten bij B&B Johanna! We vertellen onze verhalen in geuren en kleuren (net zoals Kris) We duimen voor jullie toekomst en hopelijk horen we nog iets van jullie, want jullie waren in zo een korte tijd onze vrienden! Groetjes. Just a fantastic time! - and made all the more pleasurable by your great approach and companionship. Thank you so much for a great time. This has been the most relaxing and enjoyable time. The barge is amazing. The meals and wine were absolutely delicious and the tours very informative. It was great to share your company the whole time. A very memorable holiday! Merci encore pour votre accueil et votre sympathie lors de notre passage ce week-end. Ce fut un enchantement de découvrir votre péniche admirablement bien décorée et dans laquelle nous nous sommes très bien sentis. Un concept génial qui nous a permis de passer un admirable cap pour Nicolas. Au plaisir de vous revoir, en Belgique ou lors d'un voyage au fil de l'eau en France. Free translation: Thank you again for your welcome and sympathy during our visit this weekend. It was a delight to discover your barge so beautifully decorated and where we felt very well. A brilliant concept that allowed us to spend a wonderful birthday for Nicolas. Hope to see you in Belgium or while traveling on the canals in France. Thank you so much for having us this week aboard the beautiful Johanna! We had a great week with lots of laughter, wine, amazing food, and great company. Looking foiward to seeing you again in the future! Van de talloze reizen die ik in mijn leven reeds heb gemaakt, was deze cruise van Brugge naar Parijs de meest rustgevende en ontspannende ooit. Free translation: Of the countless voyages I made in my lifetime, this cruise from Bruges to Paris was by far the most relaxing one. Thank you both for being such amazing hosts! I was amazed how modernly maritime the Johanna is furnished! The rooms had everything I needed to feel at home. The food was phenomenal! Delicious 3-course cuisine comprised of the freshest local ingredients, crafted by a par of world-class chefs. This was my first time ever in Europe, and I'm convinced there is no better way to tour. Will be looking to you both for future adventures into other countries. Thanks for the memories. Nice hosts. Patsie and Kris are the greatest. One highlight for me was helming the ship. The Strépy locks were awsome. Thanks for your hospitality, "the best". Please come and visit us in Gosport. We had a FAB-U-LOUS time aboard the Johanna. The Strépy Locks had to be the Highlight for us. You both looked after us so well. Thank You. What a wonderful week we spent on your beautiful boat. The food was super and we do enjoy spending time with you. Thank you so much. Thanks to Johanna too! Thank you for a perfect voyage of discovery of West Flanders. Forever in our minds will be the magic of floating down the canals and watching the sun-dappled countryside. Your boat is beautiful, the food assumptious and the company delightful. Best of luck! 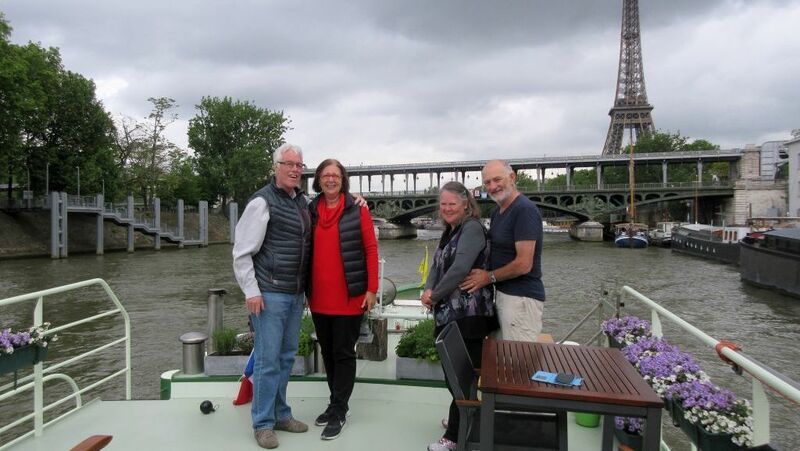 Informal barge cruises in Belgium and France. We'll send you a link to our PDF folder and keep you informed of our special offers, last minutes and other reductions. Book trough our agents and get additional services to make your holiday a succes. KR-line & Johannacruises © Kris Rotsaert. 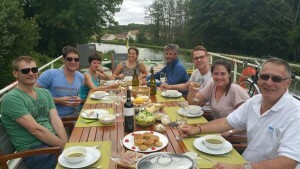 Informal barge cruises in Belgium and France on luxury hotelship Johanna. By using this website, you agree to accept cookies. We do not collect personal information.